Here’s a foray into personal sci-fi nostalgia. 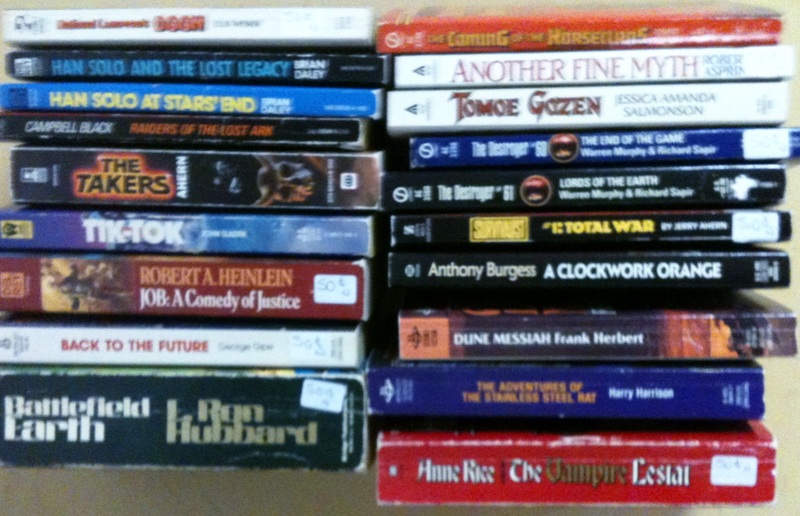 The books in the fuzzy picture below were boxed in my parents’ basement. Some of them even have tags from a garage sale that never happened while I was away at college. Collectively, they give a pretty good accounting of my junior high school reading habits. Comedy was big–Another Fine Myth and National Lampoon’s satire of Dune. Movie tie-ins too; I remember Brian Daley’s Han Solo books fondly. Other stuff’s foggier in my memory. Completely loved Tomoe Gozen by Jessica Amanda Salmonson, but I couldn’t tell you the plot today. Don’t think I finished the Horseclans and know I didn’t finish Heinlein’s Job. I remember reading Battlefield Earth during 7th grade shop class, before I lost interest 400+ pages in. The “men’s adventure” stuff is there too. Don’t recall the plots of the two Destroyer (Remo Wiliams) books pictured here; as I recollect Chinese Puzzle was the one to beat in that series. And the post-nuclear Survivalist series is a nice reminder of late-cold-war boy fantasies. This entry was posted in All Posts and tagged Anne Rice, Brian Daley, fandom, Han Solo, Harry Harrison, nostalgia, Remo Williams, Sci Fi, science fiction, Stainless Steel Rat, Star Wars, Tik-Tok, Tomoe Gozen. Bookmark the permalink.